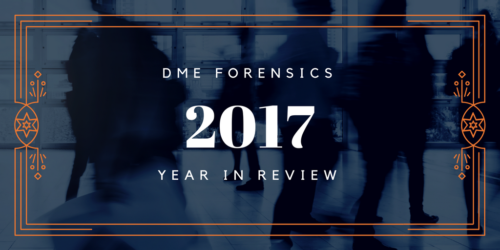 It’s been a really big year for us here at DME Forensics. Just over one year ago we moved the company from Virginia to our new home in Colorado and I can say with absolute certainty that we are loving it here! We were very excited to release DVR Examiner 2.0 in July of this year. This release was a significant update and improvement to the user interface and capabilities of DVR Examiner, and sets the framework for continued improvements. This update a complete redesign of the backend engine, giving way to new features and functionality for the program. Check out our DVR Examiner 2.0 release post to learn more about the features and improvements . We also have some great updates planned for DVR Examiner, starting in January with continuous filesystem updates. Similar to the way that virus definitions get updated more frequently than the antivirus software itself, we feel that this update will bring tremendous value to you by providing access to new and improved DVR filesystems at an even faster pace. If you aren’t already signed up for our Instant Release notifications, you can do so from our user portal. If you haven’t tried DVR Examiner 2.0 yet, what are you waiting for? Sign up for a 30-day free trial today. If you’ve already used your free trial, but want to check out all these new changes you can contact our sales team at 800-413-0363 or emailing us at sales@dmeforensics.com. This year we focused heavily on building our technical support team and processes. As a newly promoted Technology Support Manager, Matt Hernandez oversees our new technical support agents Mike and Ben. All three team members are available to help assist our users with their DVR Examiner needs. This year, the technical support team responded to ~2,000 emails and inquiries. On average, our team responded to those inquires within 6 hours! With some of our new initiatives planned for 2018, we hope to make it even easier for you to get the support that you need. From instant live chat on our support portal, handy how-to guides and videos, and our new Getting Started with DVR Examiner monthly webinar series, we want to ensure you are getting the most out of DVR Examiner. Keep an eye out here on our blog and subscribe to our monthly newsletter for more updates on these initiatives! We have some big updates coming in 2018 for our Services department. In an effort to continue to focus on innovation and expertise in surveillance DVR data recovery, we are introducing a new Advanced Technical Services team. This will bring a change to the number and types of services we provide, including DVR recovery and analysis. Stay tuned in early 2018 for more information! We’d like to thank you for your support over the past year, and we look forward to growing with you even more in 2018!